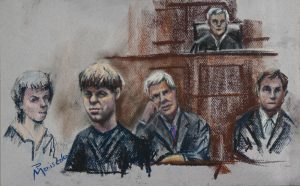 I spent this past Monday sketching at the Dylann Roof jury selection hearing at the federal court, in Charleston, SC. I will likely be producing more sketches during the upcoming trial as well. 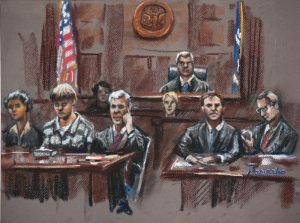 It should be noted from the start how cool that in the age of digital technology and instant gratification that the international media had to wait for an artist to finish each drawing in order to report on the hearing. Several media outlets interviewed me because I was also the only person in court who was not involved directly in the case. I became sort of a media correspondent as well as the official sketch artist. 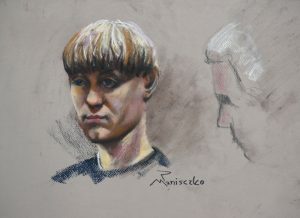 Many things struck me during the hearing but the serenity of his malevolence was most astounding. Although he maintained a downward gaze for the prospective jurors, I noticed he laughed at all the judge’s jokes and yucked it up with his defense team and guards between sessions. Clearly, this is all fun and games to him. I’m not a fan of capital punishment but I couldn’t help imagining that smug smile fading as he one day drifts into oblivion. This is but one possible outcome, however. The other is that he receive life in prison. At one point, between jury pools coming and going, he stared me down as I was drawing him, as if to say, “Ha, you have to draw me.” I debated whether to show him the drawings. I opted not to, as I felt it would only feed into his sick narrative. It was very creepy indeed. The Post & Courier did an interesting article about my experience. I will never forget that face. It was not the first time I’ve had to confront evil directly. And it probably will not the last. What was most fascinating and disturbing was his seemingly gentle demeanor, uncharacteristic of our idea of evil. I’ve noticed evil rarely appears as ugly as it is. It can look and sound reasonable, even pleasant. But when it acts, detached from the consequences of its actions, it is devastating. This dissociation from reality is not only hard to depict in pastel but hard to combat in our society. I must say, we are doing a pretty terrible job of combating evil. We are in the midst of a mass hysteria, a veil of evil has distorted our ability to see the dark forces running wild right before our eyes. Those of us who can see through it, need to share our insight before it is too late. That is certainly part of my role as a courtroom sketch artist. As I work on these sketches I see myself serving two roles simultaneously,which may appear to be at odds with one another, but really aren’t. As a member of the media it is my job to record my impressions of what i see as accurately as possible. What i observed was a young man, who appeared light hearted, laughing at the judge’s jokes, cutting up with his guards and defense team. I noticed smirks and a general unwillingness to engage directly w jurors. I also observed him staring at me, personally. As a member of the media I felt obligated to capture these observations. As an artist, as a human being, as a citizen of charleston, I am responding and expressing these observations. If I were a photographer I would have the same obligation. I did not add or infer in my sketches anything I did not observe. The article was a conversation about my personal feelings around the experience, to which I am entitled, last I checked the constitution. I think its important to note how seriously I take the trust placed in me by the community, both as an artist as well as my role as a member of the media. I strongly believe what I do is important, challenging and of great benefit to society. I think that the Federal court’s tradition of tapping the talents of a skilled artist, trained in honest observation to perform this vital service to the community, is the most effective way to record these historical moments. Nancy Ferguson liked this on Facebook. Don Christopher liked this on Facebook. Lisa ‘Morris’ Hermesmeyer liked this on Facebook. Thanks for sharing the experience. I look forward to more of your work. What an interesting use of your talent. Your work certainly reflects you conflicting feels. Laura Villasurda LoDuca liked this on Facebook. Paul Burnett liked this on Facebook.